There has to be a happy marriage between company ethos and liquid to properly engage with the whisky geek community (me and my friends) . For instance, I am not the biggest fan of Glengoyne whisky. It is fine, but not my favourite. Bit on the dry sherry side and slightly sour for me. But I always recommend people try it (if they say they want sherried whisky) and I especially recommend visiting their distillery. Why? Because of the ethos of the distillery i.e. supporting their local community, putting on an excellent tour and catering for the connoisseurs, really appeals to me. On the flip side, the liquid can’t be hideous. There has to be a line in terms of how much ethos and experiences influence your palate. An example of this is some whiskies I have really not enjoyed: Ardbeg Supernova 2, Bruichladdich Infinity and Edradour Chateux d’Yquem finish. I drank all of these with my friends, and they all have a very different ethos but the liquid was still awful for me. Even in a nice environment, your palate can only be fooled or influenced to a certain extent. I have just been up north visiting Lucas in his new role. He is now doing a bit of work for Inverhouse. I suppose you could say consultancy. If you want more info on his role, take him out for a pint and ask him. We flew up to Wick on the Wednesday. 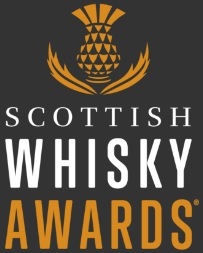 By we, I mean this motley crew: James Saxon from Scotch Odyssey, Jason from Guid Scotch Drink, Karen and Matt from Whisky for Everyone, Mark from many places including the Glasgow Whisky Festival, Keith from the Whisky Emporium and Ben Ellefsen from Master of Malt. We spent an excellent afternoon with Malcolm Waring (Distillery Manager) walking through the distillery and chatting to him about Whisky, process, management, pig farming, beer drinking, philosophy . A thoroughly entertaining and warm man. He said to me: ‘always treat someone like you want to to be treated’. This was his secret to managing his distillery. Big business take note. He also fed his pigs on the pot ale and draff. By all accounts, they are gonna be tasty pigs! They don’t use any peat at Pultney. I thought the barley must have a wee bit of peat, since the whisky has a certain body and kick to it. 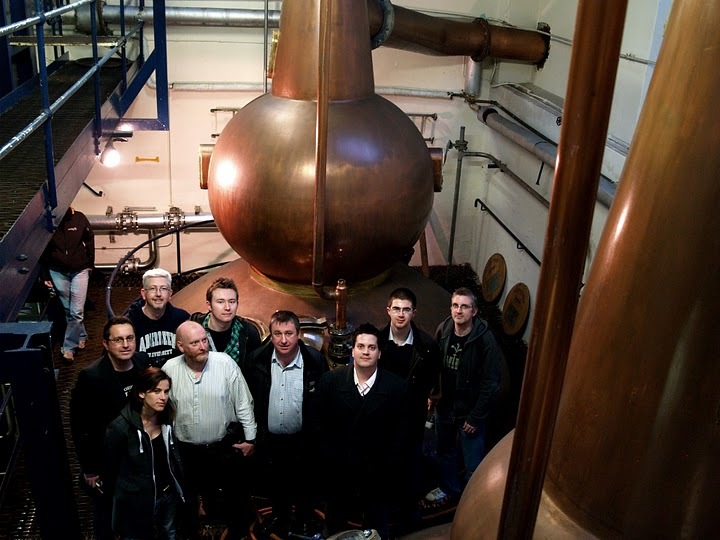 This can be attributed to: the shape of the stills, the consistency of the mash and where it is matured. 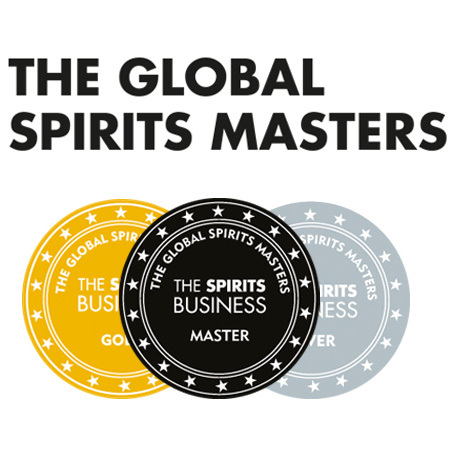 Where you make your whisky definitely influences the whisky. Look at Pulteney. They have to use dried yeast. That is the hardiest and longest lasting. Different yeast effects the flavour in different ways. If the roads close due to snow, Malcolm still has to be able to make whisky! They buy their barley locally, so this is going to affect the flavour. I quite like the wash at distilleries and the barley. Gives me something to drink and munch while walking about. Don’t drink to much of it though! We did a vertical tasting, and Pulteney really showed it’s versatility. The 12 is a sweet delightful spirit. Perhaps not something to excite connoisseurs, but for someone who deals with people who need a touch of persuading regarding the amber liquid, this is a whisky I would use for people’s introduction to whisky. The 17 and 21 are both excellent, showing more of the weight and depth you get from Pulteney’s odd shaped stills, but for me the start and the finish of the tasting were my favourite. The 12 and the 30. They fit into my current need for sweet, rich, robust and fruity malts. We tried a 1990 Old Pulteney single cask. 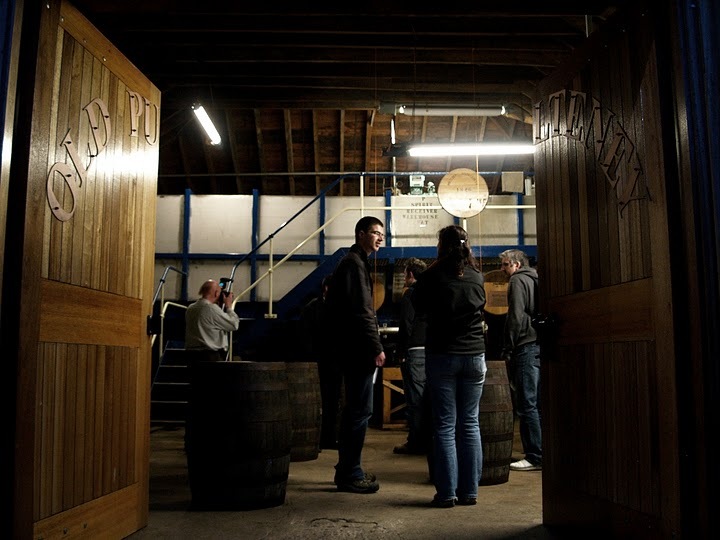 The cask had been used for peaty whisky, and then filled with Pulteney so there was evidence of residual peat. This showed me peated Pulteney. I liked it, it was novel. I considered buying a bottle, but I don’t think it actually represents the distillery. It is a novelty, an excellent one at that, but just a novelty. That night, we drove to Tain (well, when I say ‘we’, I mean our estimable guide: Cathy James). We had dinner with John (Master Distiller at Balblair) and built our excitement for our distillery tour at Balblair (10 am!). Oh yes, this trip had just began…. This entry was posted	on Wednesday, November 10th, 2010 at 6:01 pm	and is filed under Musings. You can follow any responses to this entry through the RSS 2.0 feed. Responses are currently closed, but you can trackback from your own site.